"How long, thought Eliza, since I have walked in a garden in the evening? She looked through the deeply set iron gate, so narrow and dark in the hollow of the garden wall, and wondered whether or not she would lift the latch and walk in among Olivia's carefully grown flowers...... She opened the gate and walked in. Down the long paths Eliza walked, where Olivia's delphiniums bore themselves with a pallor and reticence in the night - their blue quenched of its burning. The evening was so still and hot that all colour had soaked into the air except where a point of land, far out to sea, was the daytime blue of a pale delphinium; absurd as a picture of a desert and as silly as it was lovely in the night. Droves of irises were grey-winged, lost in the evening; peonies were white shells round crowns as dark as moss now, only in the daytime golden, and their scent past sweetness. Not a flower scent, but beyond that. A dark scent. A tree of lilac, a broody and exotic white hen, plumed and perfumed, Eliza passed and the nearly sulphurous depths of scent where lupins grew. All colour was lost, soaked into the darkness, breathed out in scent, given to the night, given to Eliza as she walked along, her mind held in an animal delight both sharp and languorous." - extract from 'Full House' by Molly Keane. 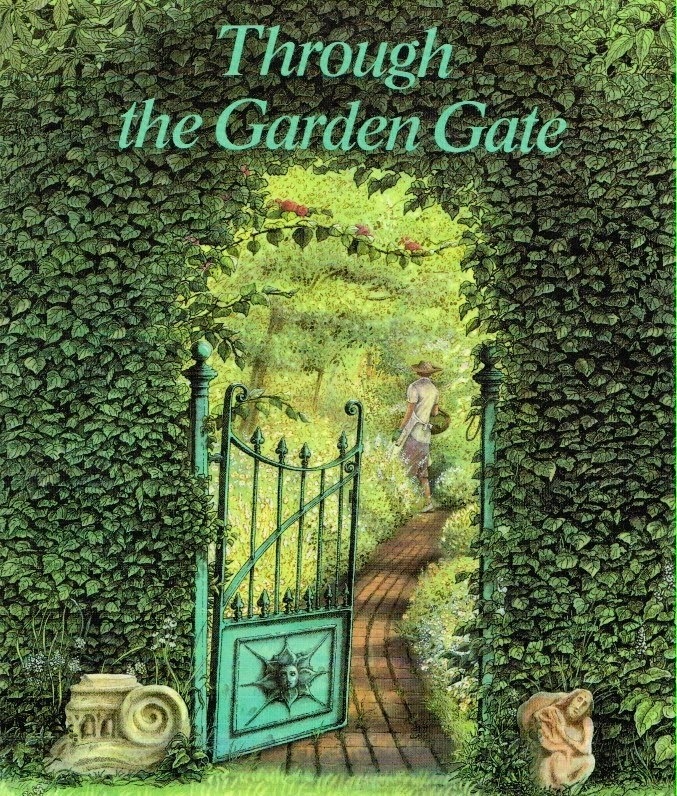 the illustration by Angela Barrett is from the dust jacket of Susan Hill's book 'Through The Garden Gate' which in turn has a magical chapter entitled 'The Night Garden'. I came away from the allotment today with a skip in my step despite another session of horsetail tug of war. The reason was that I was able to pick the very first sweet peas of the year. Not enough for a substantial bunch but a few stems to sit alongside some roses. This year's sweet peas are two I've not grown before namely 'Erewhon' and 'Fire & Ice' as well as the familiar 'Cupani'. I usually grow 'Matucana' but 'Cupani' is very similar. Plants from autumn sown seed ended up being too straggly to plant probably because of the mild winter so I sowed again in spring using root trainers. I now have two wigwams at the allotment, each made up of seven bamboo canes, with two plants planted at the base of each cane. 'Cupani' has still to flower. Of the other two it's still early acquaintance but I think that I prefer 'Erewhon'. I will report back more fully later in the year. I'm castigating myself for not sowing some darker shades too. There were not enough sweet peas to fill the container so I supplemented them with a few 'Blush Noisette' roses. The flowers are in a little china teacup (probably about 4 inches high), which is one of a pair that I bought from a local charity shop many years ago. Both the cups and saucers have minute chips but with a bit of guile these imperfections can be easily disguised. I'm looking forward now to picking many bunches of sweet peas during the summer from the allotment. My sweet pea vases usually reside on the kitchen windowsill and make washing the dishes a much more pleasurable pastime. This arrangement was photographed outside this afternoon. Thanks to the lovely Cathy over at 'Rambling In The Garden' who came up with the excellent idea of sharing our vases of flowers on a Monday. What a great way to start the week! Today will offer very limited photo opportunities as we are committed to family celebrations, on what we hope will turn out to be a sunny day for a beautiful June bride, so the camera came out yesterday. A whizz round before an allotment session and then another on my return. The day started on the damp side after unexpected rain the evening before but it turned into a sometimes bright and warm day, when there were plenty of bees and butterflies about. Top row from left to right - alchemilla mollis, astrantia 'Gill Richardson' which performs better than any other of my red astrantias and salvia nemerosa 'Caradonna'. Middle row from left to right - the first darkly delicious flowers of clematis 'Petit Faucon' - the colour fades with age, linaria purpurea and leycesteria formosa. Bottom row from left to right - astrantia variety unknown, rosa glauca - the foliage of which is probably more attractive than the flower and a geranium pratense graced by a visitor. 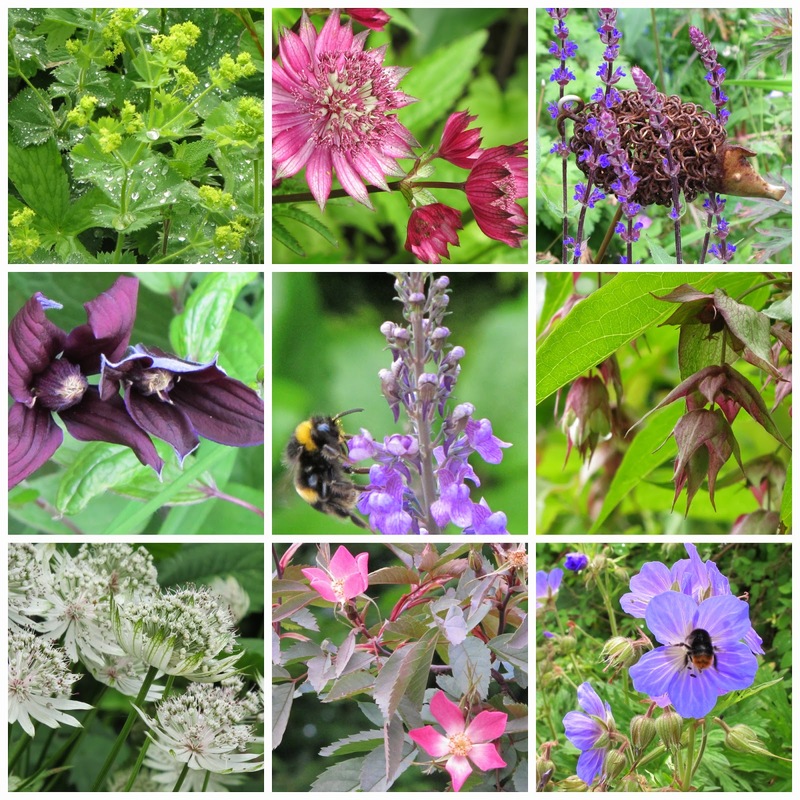 There are a myriad of June flowers to linger over at May Dreams Gardens, with thanks to Carol as always for hosting. What a great opportunity to share our June blooms and grow our wish lists! Sometime between my May tree following post and now my affection for my willow has rapidly diminished. Remember those innocent looking catkins - well every year without fail they turn into a billion of fluffy missiles that float away causing an unsightly mess in their wake. This year's initial snowstorm coincided with the late May bank holiday and is still continuing. The fluffies coat the ground, the washing line, the greenhouse etc., etc. and would no doubt make their way into every room in the house if we were to leave the windows open. Sometimes the fall is so intense that I'm too frightened to open my mouth outside but as I mentioned in a previous post I count myself lucky. I could after all live in Moscow and have to contend with some decidedly anti-social female Balsam poplar trees. Another happening has been the appearance of orange blisters on the some of the willow leaves. I think that these may be some sort of rust fungus but need to find out more. I'm going to see if I can get hold of a leaf to examine this phenonomen more closely. This will involve an almost impossible aerobic feat so don't hold your breath. I've also only just noticed the dark spots on some of the leaves in the photo. My eyes must have been distracted by the fluffies when I took the photo. I'm not sure what these marks could be. I'm sure that the willow hosts all sorts of wildlife but rather disappointingly I've only observed the odd squirrel and wood pigeon in its branches. Underneath has more or less morphed into a mass of humungous nettles dotted by the odd fern. No doubt I will harbour fonder feelings for my willow by next month but in the meantime I hope to discover some better behaved trees over at Loose And Leafy. Thanks to Lucy for giving us the opportunity to share news of our chosen trees each month. 'Shows Of Hands' - Here's Waving At You! - an extract from 'Cider with Rosie' by Laurie Lee. It sounds as if Laurie's mother had what we call 'green fingers'. Talking of fingers leads to hands which are certainly 'the tool most precious to a gardener', as Michelle at Veg Plotting writes in her invitation to bloggers to hilight hands and join in her Chelsea Fringe project for 2014. I must admit that I look down at my hands sometimes and think that they do not belong to me. Am I slowly turning into an alien? No but my hands reflect that I'm getting older more than any other part of me. Well the grey hair can be covered with 'Black Cherry' but the hands are harder to disguise. They are becoming increasingly chicken wrinkled and at this time of year seem to be permanently scratched and dirt engrained. I hear my mother's voice in my ear urging me to wear gloves and use hand cream and reflect that they would probably look better if I had heeded her advice. However regardless of appearance they have served me well over some thirty years or so of gardening. I wonder just how many seeds they have sown, how many cuttings they've taken, how many plants they've planted and just how many weeds they have pulled out. When I think of this I'm not surprised that they look past their sell by date. However I'm eternally grateful for their service. Unfortunately my hands also suffer from various allergic reactions (even more reason to listen to mum) and are not a pretty sight at the moment. So no photo of my paws today but one that some of you maybe familiar with if you are already a regular visitor here. It's perfect for saying hello to you and to say thank you for visiting. The photo is of my blog atavar and was taken at Sudeley Castle, in Gloucestershire in 2008. 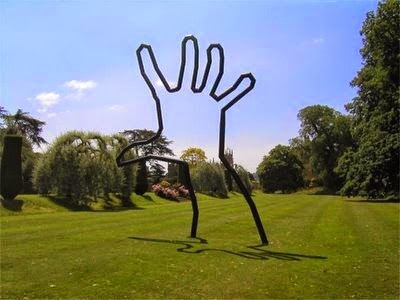 The gardens were home to an exhibition of sculpture including a gigantic hand. You can see and read about some of the other exhibits here. The 'Chelsea Fringe' is now entering its last few days. If you are fortunate enough to live in or near London, Bath, Brighton, Bristol or Kent there are some great events going on this week. If you are further afield you can still participate in Michelle's project over at Veg Plotting until the 8th June. What a great idea for bloggers from all corner of the globe to join hands together in celebration of our love of plants and gardens and be part of this special event. You've got to hand it to Michelle for coming up with such a brilliant idea after last year's magnificent 'Blogger's Cut' cake extravaganza. I'm still recovering after eating my way through this work of art. I'm now wondering what's in store for 2015!